Sorry for the delay between this post and the previous post. A break with a lot of PLM work on my side and no adverts on your side: win-win. But now I have time to continue the serial around PLM 2.0. We are in the middle. In the first post I described the changes in PLM messaging from vendors – PLM 2.0 or similar terms. In the second post I described the current challenges of PLM, which are well known – if you have access to in LinkedIn to the PLM related groups you will find discussions around the challenges of current PLM. And they set the spirit – good or bad. Now in this post I will bring up some trends, which to my opinion, unmistakably must lead to a new way of PLM in order to adapt to the future. Generation Y: It is interesting to learn that everywhere companies are complaining or warning that their existing workforce is going to retire with all their knowledge without decent follow-up. In parallel they state it is difficult to find new employees with similar skills that will guarantee the future of the company. The new generation of workers, often identified as Generation Y, has different skills and different motivations. Some interesting generalizations (note I am not a social anthropologist). The older generations were raised with the concept: Knowledge is Power – You as an individual needed to have in-depth skills to be the right person for a job – a job is your life and for life. As a negative result of this approach, you see that exactly this older generation sometimes ‘sits’ on their knowledge as a kind of job guarantee – they do not like sharing information – “Come to me and I will help you” is their motto till they retire. Generation Y does not have this job for life attitude – they look more for short term success and fulfillment and therefore they do not fit so well in the way traditional companies work. They are not the type of knowledge workers previous generations had, but they are, thanks to their skills with modern digital media, capable of finding information and combining information into knowledge. They work different. The way information is presented (too structured, boring screens). For them PLM needs to move more to an intuitive way of presenting information, capturing data as-if it is something like serious gaming. And the new PLM needs to have a way to manage structured and unstructured data combined. For companies that complain, they are losing skilled workers in the future, they should not complain but adapt. They should look forward and solve the problems for the future, which means a different way of doing business and implementing PLM. Do not choose what the dinosaurs did. Here I want to come back to my first post – I was intrigued by reading Steve Denning’s posts and its relation to PLM. Through the post Why Amazon can’t Make a Kindle in the USA, I found the post The Death and Reinvention of Management the best fitting with my PLM drive. Steve describes five fundamental shifts in management that make companies ready for the 21st century. 2. The role of the manager has to shift from being a controller to an enabler, so as to liberate the energies and talents of those doing the work and remove impediments that are getting in the way of work. 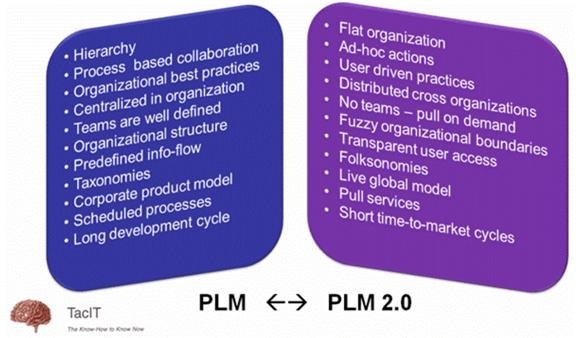 Here we see the typical PLM 2.0 targets. I will translate them into our PLM terminology. Shift # 1 – The shift to delight clients – from which PLM vendor do we hear this statement? Which PLM vendor puts the customer in focus, instead of their “superior” technology? And where do we find shift #4? How do PLM vendors address this change beyond marketing? My conclusion on this point: Both PLM and management require a change to be ready for the 21st century – It is exactly what generation Y is looking for, it is exactly what future consumers are looking for. However currently classical PLM and classical Management are dominating the thought process – and they do not like change so much as it would put past investments and achievements at risk. Already described in the two previous trends, social media concepts fit exactly in the shift that we see towards the future. It impacts the way companies change their marketing and address their customer base. In parallel it affects the ways teams collaborate in the product development space, innovation teams are global product development teams. My thought: Traditional SMBs are never the leading companies in new trends, they hang on their core knowledge and have probably a longer way to go to really adapt to the future. Startup SMBs with no historical hindrance are likely to outperform them. In a global market, innovation is the key driver to be successful combined with the point above: delight the customer. In order to delight the customer you need to innovate as delightment does not come from commodities. And with innovation I am not only addressing the consumer market, innovation is required in all areas: green products, green production as world climate and its population forces us to change. Therefore the “War for Patents” will be everywhere. We currently see in the news the tablet and Smartphone patents wars, but it pops up everywhere, some more visible than others. PLM 2.0 and while there may be some value from crowdsourcing I really think the value will be from PLM adopting social media features inside the application as opposed to opening PLM up. An example of this might be like Chatter in Salesforce. I still am not sure how useful Chatter is but I think UI features that better enable communication among the users of a PLM system and easier ways to share data outside of PLM will be the main takeaways from social media for PLM 2.0. Stephen thanks for your feedback. I think as the way companies will collaborate – more as development / delivery teams, the need for community based interactions like facebook and others might become relevant, including chatting. Imagine you have a question to one of your global team members and he/she is on-line. Would you send an email ? Jos, a belated comment on your excellent article: I have some problems with all this talk about PLM being too structured to achieve acceptance by a new generation. I may come from an”old school engineering” environment (and generation…) and that is possibly why I cannot see that the process of developing products suddenly becomes less structured at the advent of a new generation of knowledge workers. If anything, aircraft, cars and consumer products need to be developed in a more structured way than in the past if only because of increasing complexity coupled to shorter development lead times. And if PLM reflects that development process and the rest of the lifecycle, it needs to be structured too. On the other hand, I agree with you that we need additional ways to access information in PLM, ways that do not force us to follow the PLM structure, but present us with a more intuitive way to find data. I think we should be aware of the different ways users interact with PLM systems: one is about entering data as part of a product or document structure, release that data according to a (often externally) required quality process, or manage development projects. The other is about retrieving information and collaborating with colleagues within an often extended organisation; this is a non-structured process, requiring different ways of interacting with PLM: Search Based Applications, Social media. So for me it is about enhancing the structured PLM process with new tools and methods to also support the non-structured process. Thanks Douglas and I believe we are 100 % in-line.